Scenic ATV Tour at Valley of Fire followed by a Frantic Buggy Chase at Vegas Dunes Combination Package! Allow 9 hrs door to door to ensure a full non-rushed experience - complimentary shuttle service included. After the Valley of Fire experience, guests return to the main office and prepare for their 60-minute, exhilarating "Chase". We tell them, "Drive it like you stole it!" and we mean it. Part 1 - The Valley of Fire on 4WD Quads Our event starts with you being picked up at the resort of your choosing by one of our staff members and then are shuttled to our state-of-the-art facility. From our facility, you'll be transported to the first leg of your Off-Road adventure at the world-famous Valley of Fire, aptly named because of the red rock formations and sand cliffs. You will spend approximately 3 to 4 hours on a rugged 4x4 ATV tour, taking in what is quite possibly the most pristine, beautiful landscape available to off road motorized traffic in the USA. OUR VIP ATVS are Big and COMFORTABLE FULL SIZE ADULT ATVS! They are 450cc 4x4 fully automatic quads so there's NO SHIFTING to worry about! The beauty of this area is quite simply indescribable and photos do not do this destination justice. Your Off Road tour guide will stop and point out the different sights giving you ample opportunities to take memorable photos. The terrain is so alien that numerous production companies have filmed segments without having to perform modifications to the terrain. Star Trek was originally filmed here. After completing the first leg of your Off Road tour, a quick stop at the local sub shop near the trail head will provide fresh made sandwiches to order, before you take a 40 minute transport back to the Vegas Dunes Off Road recreation area for the second half of your tour... Part 2 - An Extended 60 Minute Mini Baja Chase After lunch you'll arrive at the Vegas Dunes Off Road Recreation area for the second leg of your adventure tour. 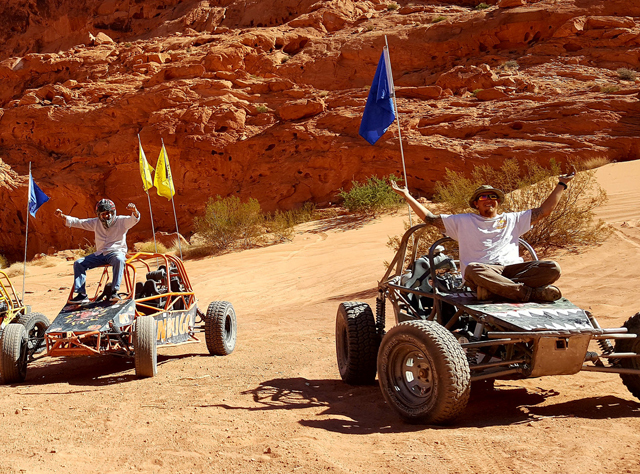 This course you will be traveling on what was recently featured in the ROLLING STONE Magazine and referred to as “LAS VEGAS’ BEST NEAR DEATH EXPERIENCE.” You will go on a full ONE HOUR CHASE which is a 30 minutes more than our regular Mini Baja Chase! Doesn't sound challenging? We’ll see what you say afterwards. You will be operating a state-of-the-art vehicle which is a cross between a desert racer and a dune buggy on a 35 mile course that will subject you to dried out river beds, sheer cliffs, a place called rattle snake rocks (guess why), and look out dune, a vantage point where you take a brief break and can see Lake Mead and the Las Vegas Strip on the horizon. For those who may not feel comfortable driving an ATV, you may ride along with the guide as a passenger on the Valley of Fire portion for the same cost as the ATV/Buggy Price. For those who wish to share a vehicle on the Mini Dakar, a 2 seat package is also now available where you'll have a 2 seat vehicle both at the Valley Of Fire (typically a UTV) and on the Mini Baja Chase (always a SunBuggy on the Chase).